Elsevier is reporting that a team of researchers from the Plasma Physics Research Centre, Science and Research Branch of Islamic Azad University in Tehran, Iran, have discovered a way of making paper supercapacitors for electricity storage. 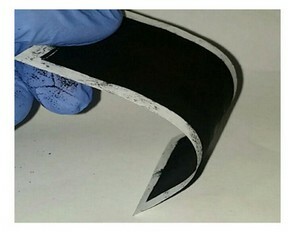 Image of paper supercapacitor in a bent state. Image Credit: Dr. Leila Fekri Aval. Heliyon. At one sheet thick, these new supercapacitors can bend, fold, flex, and still hold electricity. The team’s research paper has been published in the journal Heliyon. The term “supercapacitors” is reserved for devices that hold over 10 times as much energy per unit volume as a traditional capacitor, and that can charge and discharge quickly. Paper supercapacitors are lighter and cheaper than other types and those developed by lead author, Dr. Leila Fekri Aval’s group are more flexible than earlier paper supercapacitors, giving them a whole new range of potential uses. Today, if you need to store a large amount of energy, you will typically need to use large, heavy rechargeable batteries. Supercapacitors can do this too, but at a step up: They charge and discharge more quickly than conventional batteries – in minutes rather than hours – and they can be charged and discharged more times over their lifespan. Dr. Aval anticipates that the commercial and domestic applications of these supercapacitors will soon increase and the cost decrease, so the technology will become available to the mass market. “Energy is our most important challenge in the future,” said Dr. Aval. “It is important to build a device that stores energy, has high power and energy density, but at a low cost. This is what inspired our research into paper supercapacitors. It is pleasing as well as a bit of a relief to see good news out of Iran when the regime seems determined to create an anti Iran worldview. Above all we wish the team the greatest of success, confirming replication results and personal safety. What is seen in the west’s media gives considerable alarm, thus the idea that leading edge science research is underway is a marvelous revelation.